Home » How Much Do You Spend? This past weekend, the Energy Information Administration (EIA) released the latest figures for the 2012 State Energy Data System (SEDS). Each year, EIA publishes comprehensive statistical estimates that explore energy production, consumption, prices and expenditure, with historical figures and state-by-state breakdowns. Over the next few weeks, we’ll be bringing you a few graphics and maps using SEDS, aimed at helping you understand how you use energy, and how much people like you are spending on their energy needs. It is difficult to pin down exactly what an average person’s energy expenditure is, but we took a crack at it. The SEDS dataset breaks energy expenditure into four end-use sectors: residential, transportation, industrial and commercial. In both industrial and commercial energy, businesses -- as opposed to people -- purchase energy. As a result, the cost of energy is passed along through the price of the goods and services to the consumer. When we look at how much the average person is spending directly on energy each year, we focus on energy expenditures in the residential and transportation sectors. Energy in these two sectors is primarily in the form of gasoline, heating fuel and electricity. To approximate the state-by-state amount of money spent by an average person on energy each year, we combined a state’s total energy expenditure in the residential sector with its total energy expenditure in the transportation sector and divided it by the total population of the state. We adjusted historical numbers for inflation. 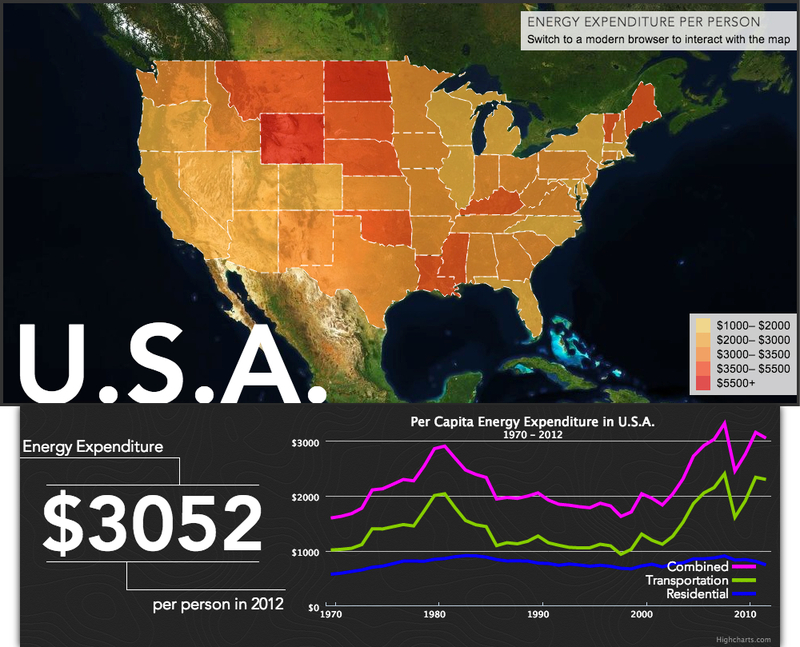 Exploring the interactive map above, you have the ability to click on each state and learn about how energy expenditure differs from state to state. In the graph under the map, per capita energy expenditure is broken down between residential and transportation costs over the last 40 years. You can find your state and see out how much someone like you spends in an average year. In most states, the transportation costs far outstrip the residential costs. This is because petroleum prices are higher than the prices of electricity and heating from coal, natural gas and renewable energy. Take, for example, the consumption and expenditure data from Pennsylvania for 2012. Here we can see that transportation and residential energy consumption is roughly the same, around 900 trillion Btu for 2012. However, looking at expenditures, Pennsylvanians spend more than twice as much on transportation than on residential energy. Knowing this fact, it comes as no surprise that sparsely populated states in the Mountain West and Great Plains show both higher expenditures on transportation energy as well as higher total energy expenditure. In these states, the average person must drive farther and more frequently in their daily lives. In contrast, more densely populated places such as New York, Connecticut, Massachusetts and Washington, D.C., show low transportation costs, likely due to the high proportion of urban and suburban dwellers and easier access to public transportation. On the other hand, residential energy expenditure per person (see map below) is much higher in these states than in the rest of the country. This is likely because retail electricity prices are on average 3 to 5 c/kWh more expensive in New England and the Middle Atlantic than in the rest of the country. Still, when we compare residential spending with transportation spending, we see that transportation spending mirrors -- or perhaps drives -- the total energy expenditure much more directly than residential energy expenditure. In fact, the graph of historical energy expenditure in states with a heavy reliance on driving is essentially a graph of the changes in gas prices. We see a spending spike in 1981 when gas prices were very high, just like we see a decrease in spending in the mid 1990s when gas prices were stable and remarkably low. If you’re looking for ways to reduce your energy spending, the best way is likely to increase your vehicle’s efficiency. From taking small steps to improve your car’s fuel economy to switching to an alternative fuel vehicle like a hybrid or electric vehicle, there are plenty of ways you can save money at the pump. For a few tips on how to decrease your transportation energy costs, head over to Energy Saver to learn more. Energy Saver also has a ton of great tips for how to reduce your residential energy costs through things like weatherization, retrofits, remodels and landscaping improvements. If you enjoyed exploring our map on energy expenditures, stay tuned in the coming weeks for other charts and graphics related to your energy consumption and use. Can’t wait that long? Head over to EIA for state-by-state energy profiles and more recently updated energy estimates. Looking for more energy data? Check out our library of energy maps.